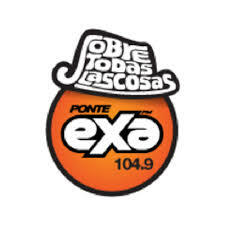 Exa FM 104.9 Mexico Radio en Vivo . XHEXA FM or Exa FM 104.9 is a Spanish & English Top 40 radio station that serves Mexico City and states surrounding the federal district. Broadcasting on 104.9 MHz, it is owned by MVS Radio and is the flagship station of the Exa FM format. Address : Mariano Escobedo 532, Col. Anzures, México D.F. 11590 , (52) 5166-3849 .